Today I was a guest on the Parenting Unplugged Radio Show. Many of you may have already heard the interview, but if not you can listen to it here. They also have a podcast on iTunes. I love podcasts because I can listen at my convenience while running errands or working around the house. 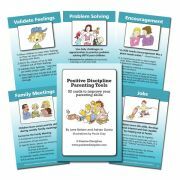 So it sounds like we are all on board for this New Year Parenting Tool Card Challenge. It will be fun to share the experience with you all. I wanted to mention that if someone is reading this post later in the year, you are welcome to join right in and start in the middle. We won't be using these tool cards in any particular order, so each week will be a new adventure. And because of the demand for the tool cards, don't be concerned if your cards don't arrive before we start. Thanks for all the great comments and I will be posting a blog with the first tool card this weekend.